Mississippi is blessed with an abundance of luxuriant forests. The 1900 U.S. Census of Manufactures reported, “The state was originally nearly all covered with timber, consisting of pine in the southern third, of which a long tongue extended nearly to the north line of the state, following roughly the divide between the Mississippi and the Tuscaloosa rivers. There was also a small area near the Tennessee River in the northeastern corner. Elsewhere the timber consisted almost entirely of hard wood with much cypress in the Yazoo Bottom.” From the towering longleaf pines in the south to the hardwoods of the northern hills and the cypress of the bottomlands, Mississippi’s trees have played major roles in its culture and economy. At the time of the first European contact, members of the de Soto expedition described a land of cathedral-like longleaf pine forests and stands of other pine species in the southern and central parts of the region, giving way to hardwoods and areas of mixed pines and hardwoods farther north. The explorers described forests that had been somewhat altered by Native Americans as they burned areas for ceremonial reasons and for hunting and cleared lands for agriculture. More than a century passed between the Spaniards’ departure from the New World and the establishment of permanent European settlements in Mississippi. During that period the Native American population was drastically reduced by disease, and the forests grew more crowded. However, the newly arrived settlers believed they were seeing virgin forests, largely untouched and unaffected by human activity. During the early periods of Spanish, French, and British control, Mississippi settlers actively used the forest resources. Along the Gulf Coast and inland in the Tombigbee region, the area south of Natchez, and north of Lake Pontchartrain, pine trees were felled to construct ships, tapped to produce naval stores, and cut to produce barrel staves. Early farmers produced hand-hewn lumber and posts to construct buildings and fences, and some produced materials for sale in the surrounding area. Small water-powered mills produced wood products commercially, and steam-powered sawmills appeared in the early nineteenth century, with the earliest engines salvaged from steamboats. Some say Eleazer Carver built the first sawmill in Mississippi at Washington in 1807. The first steam sawmill along the Gulf Coast may have been erected at Pascagoula in 1835, but it operated only briefly. Later in the 1830s several more steam sawmills were constructed at the junctions of waterways and the Mississippi Sound. The early operations were mostly located along rivers and streams, which then carried the mills’ products to New Orleans and other markets. By 1840 Hancock County (including the area that became Harrison County in 1843) had ten sawmills, Jackson County had two mills, and Lawrence had ten. Most of the raw material to feed these mills was rafted down rivers and streams from the logging sites, some of which were far in the backcountry. The Crescent City became a destination point for lumber from the interior, which was either used locally or shipped to the Caribbean and other overseas markets. Along the Mississippi River and other navigable waterways, “woodhawks” stripped the timber from neighboring forests to supply fuel for passing steamboats. Early farmers and planters regarded the forests as impediments, girdling, cutting, and burning trees to clear land for cultivation. Increasing numbers of early Mississippians harvested and processed the state’s abundant trees during the early nineteenth century, selling most of their production in local and regional markets. At Natchez in 1828 Andrew Brown, a Scottish immigrant, established a mill that employed loggers and purchased felled timber from outside suppliers and from swampers who ventured into the lowlands in boats to harvest cypress. Brown used both free white and African American slave laborers in his mill. From 1850 to 1870 Mississippi had about 250 lumber mills, and in 1860 they turned out products worth roughly two million dollars annually. The patterns of Mississippi lumbering remained largely unchanged through the Civil War and Reconstruction eras until developments in other parts of the country, the growth of national markets, and the construction of railroads changed the industry’s dynamics. During this time Mississippi’s most important manufactured products came from its forests. At the 1876 Philadelphia Centennial Exposition, sixty-eight varieties of Mississippi-grown lumber were exhibited. Mississippi lumber products again impressed visitors to the New Orleans exposition of 1885, attracting the attention of northern lumbermen and investors whose operations in the New England and Great Lakes states were running out of raw materials. By 1890 Mississippi had 338 sawmills, a number that grew to 500 two decades later. 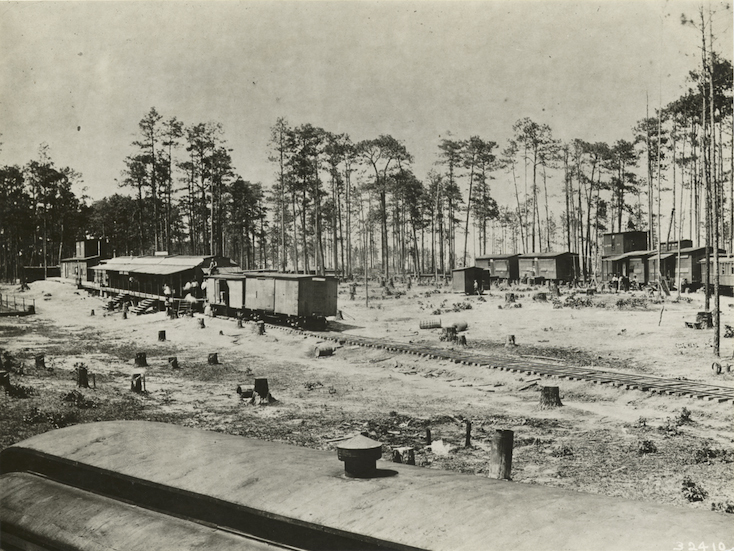 The longleaf pine lumber boom began along the Gulf Coast during the last quarter of the century, with the firm of Poitevant and Favre constructing one of the world’s largest mills at Pearlington. Spurring the industry’s rise was the tremendous growth of US cities and population, which created an enormous demand for lumber and other forest products. With forests in the northeastern and Upper Great Lakes states leveled, lumbermen found new sources of timber not only in the intermountain West and the Pacific Northwest but also in the South’s huge old-growth forests, which had scarcely been touched and could be purchased at bargain basement prices. And the era’s extensive railroad construction meant that lumber could be shipped from Mississippi to markets in Chicago, St. Louis, Kansas City, and other northern cities. In 1880 Mississippi had an estimated 24,975 million feet of standing yellow pine, and at the turn of the century, the state had roughly 32,300 square miles of timberlands—seven-tenths of its land area. Mississippi moved to the forefront among lumber-producing states, with more than three-fourths of the 1900 cut consisting of yellow pine and the remainder largely oak. The state’s sawmills produced more than six million dollars worth of lumber in 1890, and a decade later the state had more than 800 mills whose products had a value of more than twelve million dollars. Over the next decade the number of mills again doubled and the value of their production nearly tripled. In 1909 the state produced more than 2.5 billion board feet of lumber, nearly 6 percent of the national harvest. More than 2.1 billion feet was southern pine, the nation’s most important species. Cypress was also in great demand, with prices increasing as much as twenty-fold in a few years. The value of various hardwood species was much lower, leading landowners to girdle and burn thousands of board feet to make way for agricultural production. In 1919 Mississippi had just over fifteen hundred mills that produced nearly one hundred million dollars in forest products, and the industry employed more than thirty-seven thousand workers, about twelve thousand of whom labored in the woods. In 1925 Mississippi’s lumber industry ranked second in the South and fourth in the nation, and four years later Mississippi had become the nation’s leading lumber-producing state. Many of the state’s lumbermen had migrated from other regions, some were native Mississippians, and all were shaped by the dynamics of the industry. While land was cheap, the steam-powered mills and logging railroads were expensive, and capital was scarce. Most operations were financed with money borrowed through the sale of timber bonds, meaning that trees had to be harvested and processed as rapidly as possible to meet debt obligations. The state of knowledge concerning the cultivation and growth cycle of trees was rudimentary, so most lumbermen did not even consider the possibility of sustainable harvesting and reforestation. In any case, new forests always seemed to be available for exploitation, so the prevailing practice was to cut out and get out, leveling the forests and then moving the entire operation to a new location. Cutover lands were considered of low value, and tax laws worked against those who might have considered reforestation. The industry’s boom period was relatively short-lived. The lumbermen quickly cut through the longleaf, shortleaf, and loblolly pines of the southern and middle parts of the state, and the Delta saw rapid harvesting of cypress and other bottomland hardwoods, which were processed at mills in Vicksburg and other Mississippi locations and in Memphis, which for a time billed itself as the “hardwood capital of the world” because of the sale and marketing of timber and lumber that came in torrents from Mississippi and other neighboring areas. During the 1920s the last of the old-growth forests were being cut, and many of the forty thousand Mississippians who worked in the woods and mills were forced into other occupations or unemployment. By the late 1920s the state had vast tracts of cutover land and areas of scrub trees that were considered too marginal for harvesting. Adding to the difficulties was the prevalence of woods arson, committed by people who hated the large companies, thought burning helped to control insects and snakes, and/or simply enjoyed seeing the woods burn.